It was when I started my Sleek Eyeshadow series (Oh So Special here, Ultra Mattes V2 here) that I came across the Vintage Romance palette that was being sold for £4.50 on Amazon here. 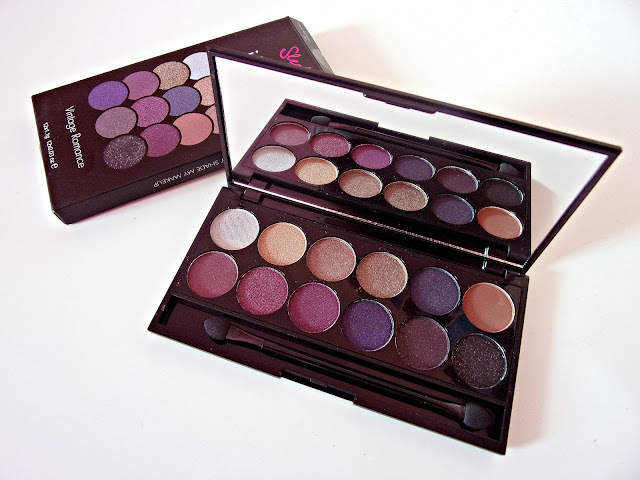 I loved the look of the cranberry and deep purple shades so it was a bit of a no brainer for me, in my basket it went. The Sleek Vintage Romance palette contains 12 shades, most of which have a shimmer finish, there's only one that I would say is completely matte. 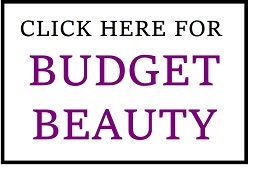 Whilst some of the shades are very bright and eye popping, it's still a very wearable and versatile palette. It's also a palette I think a lot of people would enjoy, due to the cranberry eyeshadow trend and some of the brilliant eye catching shades. 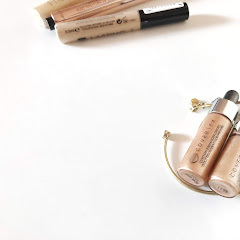 The pigmentation of most of the shades is what I have come to expect from Sleek; high quality at an affordable shade, however there are around three shades that don't quite match the status quo. I have to say that I think Sleek went all out when picking the name for these shades, I mean how cute is; Court in Cannes or Marry in Monte Carlo. It's not quite so often that shade names do catch my attention but I love how these almost read like a love story as you go across. Go ahead, give it a try! Pretty In Paris is a pearlescent light silver. 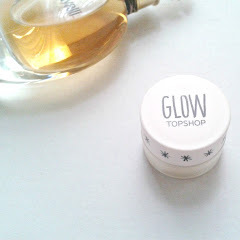 It has a decent amount of pigmentation for a highlighter shade, and it actually shows up! Meet in Madrid is a lovely slightly rustic, gold. It's a more toned down version of a pure gold, however the pigmentation is great! You only need one swipe of this for a fully metallic effect. It's also a great alternative to a highlighter shade for those who prefer warmer tones. 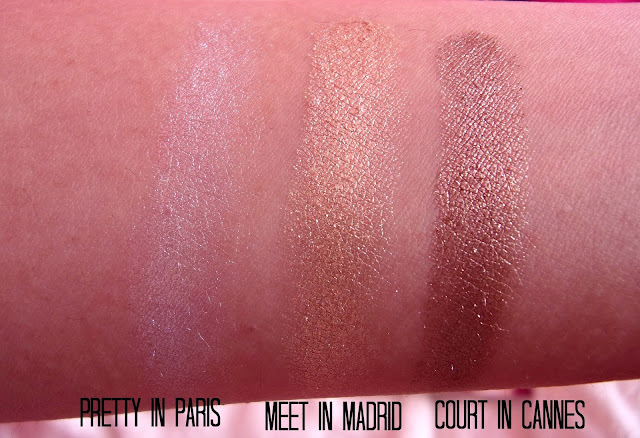 Court in Cannes is a coppery bronze with a deep golden sheen. The pigmentation is outstanding, it makes a beautiful lid shade. 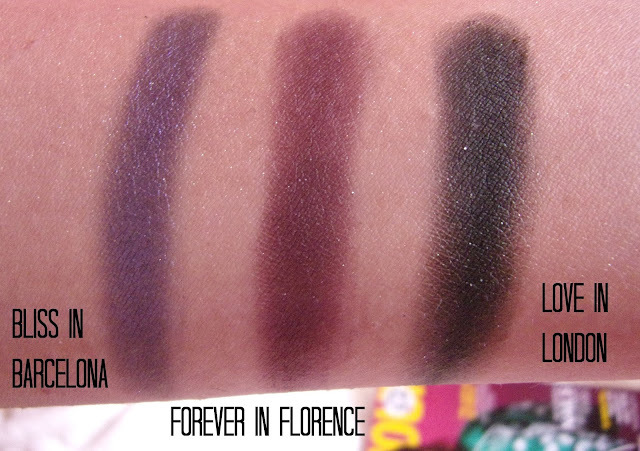 A Vow in Venice is a muted deep aubergine shade. The shimmer isn't so apparent in this shade, it comes across as more of a sheen. This would be a good shade for the outer corner. As soon as I swatched this, I was thinking it looks like a MAC Cranberry dupe! Marry in Monte Carlo is a shimmery rose pink. It's a bit lighter than I was expecting but it works well as a lid shade. 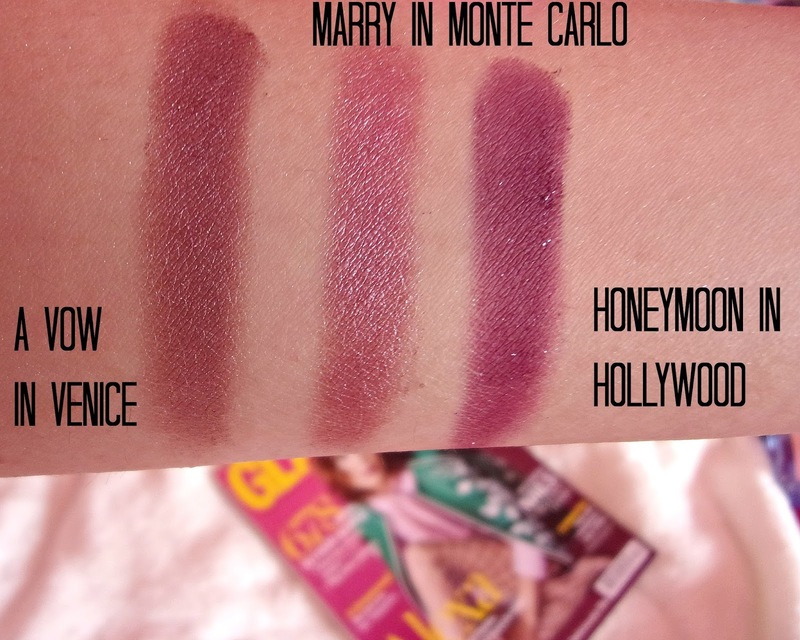 Honeymoon in Hollywood is a deep burgundy shade with a few silver flecks. 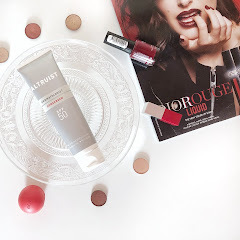 The formula feels a bit drier than the other shades but the pigmentation certainly packs a punch, it's a very bold shade and my favourite out of the palette. (I'm so glad I brought this palette for these three shades alone, I would imagine similar shades would cost quite a bit to buy separately from other brands). Lust in LA is a pale olive green with a metallic sheen. 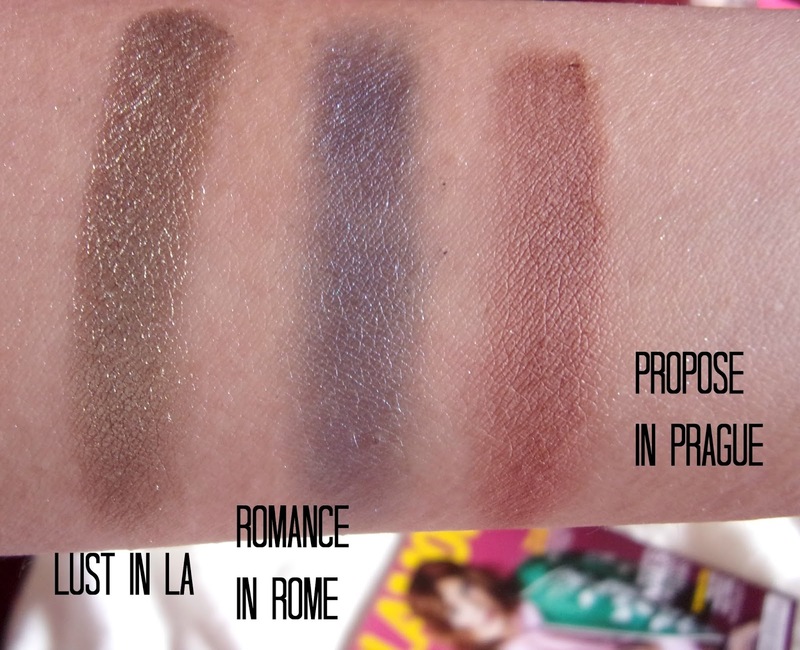 Romance in Rome is a navy blue with a metallic finish, however the pigmentation isn't as good as the other shades so it comes across as slightly subdued. Propose in Prague is a matte brown, the colour just reminds me of sand. The pigmentation of this shade is quite poor too, but it could work as a transitional shade. Bliss in Barcelona is a deep purple, with a hint of blue. The pigmentation is quite good, and the finish has a slight metallic sheen. 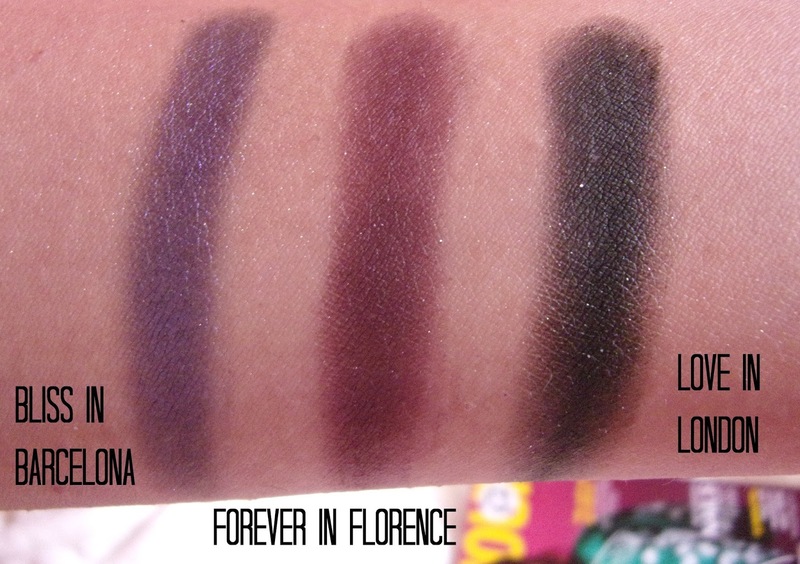 Forever in Florence is a very glittery, dark purple. I love the depth of this shade, it's great for adding that smokey look without disappearing into other shades. Love in London is the alternative to the normal jet black found in Sleek palettes. This is again a very, very deep and glittery midnight blue, but I think it works very well. It's super pigmented as well. Overall, would I recommend it? Of course! I think this palette was a steal at £4.50, and even at its normal RRP of £7.99. 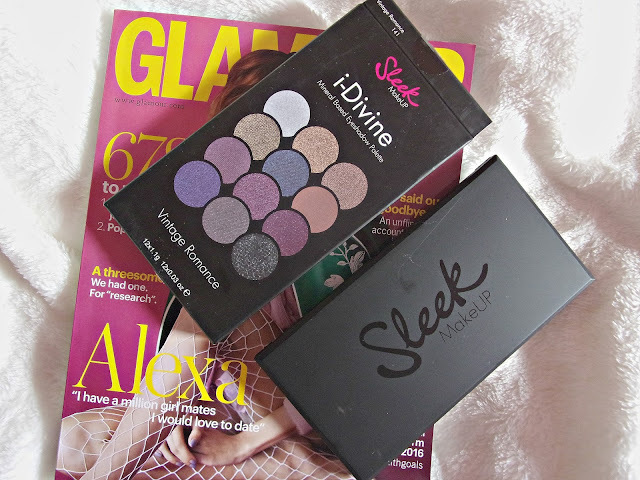 Again, Sleek have surprised with the value for money offered, and I love the mix of shades in this palette. It's definitely one to buy if you love the cranberry/burgundy hues that make a comeback every Winter. I didn't get much shopping done in Winter but boy am I making up for it now! 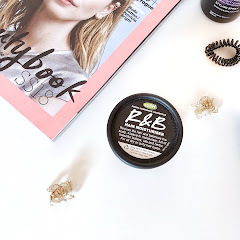 There's a few things I've had my eye on for a while so I thought I'd put a little wishlist together. 1) Until last year I hadn't ever shopped at Quiz before, but that all changed when one day my Sister roped me into going jumpsuit shopping for her Christmas party. It got to that stage where I was like 'if you're getting to try on outfits, then so will I!' So off I went and I picked up the glitziest number from Quiz, way out of my comfort zone! I always through Quiz was very prom-esque but I was wrong! The dress looked great on, and even better I picked it up for only £20 in the sales. As I write this it's still languishing in my wardrobe, looking pretty and sparkly. Anyway, moving on, I really want to get a nice gown for wedding season and I love this somewhat modest occasion dress from Quiz, especially with the capped sleeves. The quality from Quiz has also exceeded my expectations by far, so if you love dresses then I would really recommend it. 2) I really want to try out a setting spray, at first I was thinking of the NYX dewy setting spray, but at the same time I want a spray that I can use to increase the vibrancy of my eyeshadows too. So now I'm thinking along the lines of the Mac Fix+ or Urban Decay setting spray, I would love to hear about your experiences with any of the two! 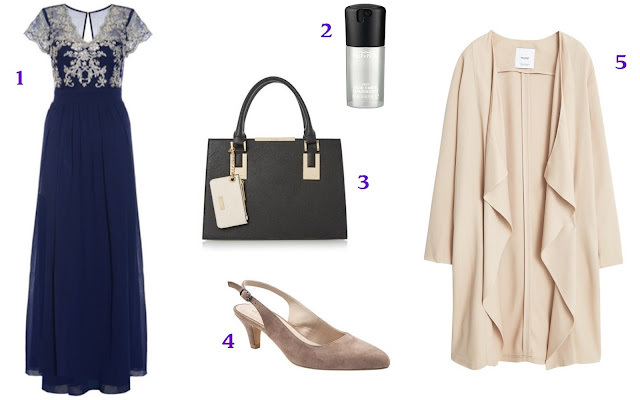 3) I've always wanted a Dune handbag, I've picked up a Dune Clutch in the sales and a Dune side bag in TK Maxx, but the handbag (here) is the dream! The problem is, with all the new releases I can't ever just pick one. 4) A new branch of Jones Bootmaker has opened in my local shopping centre and I've been pleasantly surprised by the quality of their products. For example, me and my Sister both brought a pair of ankle boots, and whilst my Dune ones have got indents across the top, my Sister's are still as good as new! I prefer small heels (that I can walk in) so I would probabaly go for something like these to go with the dress. 5) Lastly, with the temperamental weather here in the UK, I could really do with a similar waterfall jacket/trench for when it's summer, but for when there's still a bit of a chill. However, I haven't been able to find one I like so far. I would be eternally grateful if you knew where I could get something similar! PS. I had the pleasure of working with The Fort Shopping centre quite a while ago and they often keep me updated with the latest press releases, which is super kind of them! Their latest one is a Fort 'Styled by You' campaign where they get local fashion specialists to depart some knowledge and inspiration to make fashion more fun for everyone! You can read more about this here. * This post includes sponsored content.